Like most teachers, I worry about my students all the time. Especially lately. I have had some pretty sad things going on with my students at school. Some kids just have rough home lives, and various other problems/illnesses/stresses, that make me want to cry most of the time. Today, I came up with a cute way to help these students feel cared for. 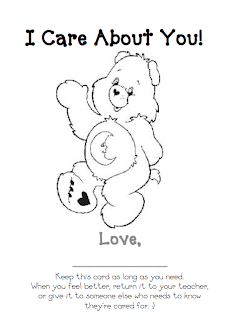 It's the Care Bear Card! Keep this card as long as you need. or give it to someone else who needs to know they’re cared for. I laminated mine and wrote on it with a Vis-A-Vis; so they can be reusable. I have included my blank template below that you are free to use! Please leave a comment to let us know what you do to cheer up your students when they're feeling sad!